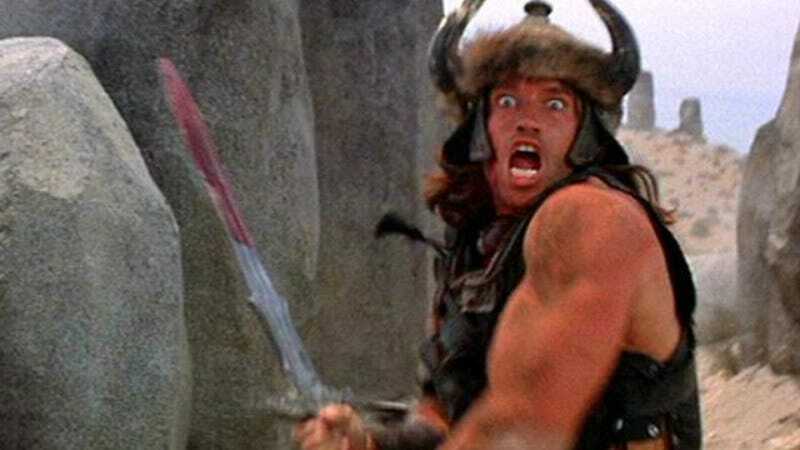 When it was first announced way back in 2012 that Arnold Schwarzenegger would be reprising an iconic role involving halting acting and comical violence, fans quickly responded with, “That’s all of his roles.” Thus, we clarified that this particular character was Conan The Barbarian—crusher of enemies, driver of said enemies before him, listener to the lamentations of enemies’ women. Writer and producer Chris Morgan stressed that this would be “Conan’s Unforgiven,” perhaps in reference to the fact that no one has yet forgiven 2011’s abominable remake. Morgan also promised that the sequel will address Conan in his twilight years, as the king teased at the end of the 1982 original. And now, Morgan says that there will be other geriatric characters adding juice to this ancient Norse version of Red. The Wrap reports upcoming Legend Of Conan will take place 30 years after the first movie, and feature “at least three” returning characters. Morgan explains the character will still be the same thug-like serial killer we all fell in love with the first time around, only with the wisdom of accumulated years lending some alterations, like making it much easier to get the Viking Denny’s Early Bird Special. “When we meet him again, Conan has been many things over the course of his life—a thief, a warrior, a pirate, a king, a legend—and is now an older man. Think Unforgiven…with a sword-wielding barbarian.” However, Morgan did not give any indication as to who the three other returning characters would be. Subotai? King Osric? Valeria? With luck, it will be Crom himself, as the hilariously named god from the first film should really get a little more hands-on at this point.